Richard Van Giesen Clements Jr.
Richard Van Giesen Clements, Jr. March 26, 1930 -- May 4, 2008 Richard V. G. Clements was a fourth-generation San Franciscan. He grew up in Piedmont, CA, and graduated from University of California, Berkeley, with a double undergraduate degree in journalism and philosophy. He had an eclectic career, during which he pursued a wide array of ambitions and passions. Some of the highlights that best sum up his interests and talents include the following: After a brief stint teaching philosophy at UC Berkeley, he became a contractor, which allowed him to apply his environmental philosophies and vision in a practical way through building. He exhibited an exquisite aesthetic sensitivity and used indigenous materials to construct his buildings, many of which look as if they grew from the land they inhabit. 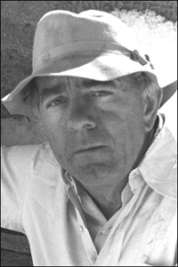 He designed many homes on spec in the Bay Area and Lake Tahoe areas. His most well-known project is the stunning Timber Cove Inn, just north of Fort Ross on the Sonoma Coast, which opened in 1963. He spent many years residing in coastal homes that he designed and built himself, in the Timber Cove and Big Sur areas. He also spent many years as a resident of San Francisco. He remained a resident of Monterey County during the latter half of his life. Clements was an avid defender of nature. He considered himself "a developer with a difference," promoting environmentally sensitive and responsible development decades before it became the norm to talk about green architecture. In one instance he was upset that the telephone company wanted to put up telephone poles around his property despite the fact that he had asked they bury the wires underground. When the telephone company left a stack of poles near Clements' land, Clements proceeded to find a truck, take the poles, and hide them. Once the Timber Cove project was complete, he went on to become the first director of the Peace Corps in the Dominican Republic. Then, after selling the inn, he took a trek in Nepal to write. When he got there, however, he decided to build a chain of hotels, each a day's walk apart. He was awarded the rights to the Annapurna trail from the King of Nepal and the Nepalese Government, becoming the first American to do business in Nepal. In the 1980s, Clements' energies turned to the financial end of development. He attended Oxford to get his Ph.D. in economics. He was concerned both about the state of affairs at home as well as the impact of U.S. lending policies on the developing world. A true Bohemian, he surrounded himself with intellectuals like Leopold Kohr, an economist, artists such as Beniamino Bufano and Ansel Adams, and columnist Art Hoppe. Clements was known for enjoying the company of people with a wide spectrum of personal and political views, many of which differed significantly from his own. He admired intelligence, creativity, and strength of character. He was a traveler, reader, sailor, mountaineer, photographer, guitar player, and an aficionado of dominoes, gin rummy, hearts, backgammon, and Go. An admirer of Ayn Rand, he was a staunch individualist and embodied a rugged determination. He was a nonconformist with an irreverent streak that both earned him great admiration and distanced more conventional folk. Clements recently died in Santa Cruz County after a long illness. He is survived by a sister, Marian Clements; three children, Pamela Clements, Richard Fitzhugh Clements, and Nínive Clements Calegari; and four grandchildren, Carolyn Clements LeBourgeois, Sarah Cooper Clements, Nínive Carmen Calegari, and Jean-Paul Calegari. His eldest son, Stephen Clements, died in an accident in 1983.